The society is the largest lay association of charity in the Roman Catholic Church serving those in need by person-to-person contact. This is accomplished through home visits made by parishioners who belong to the conference. We contribute as we are able to anyone within our parish boundaries. Membership in the conference offers opportunities for spiritual growth, friendship and service. Vincentians help the truly needy, those who are struggling to pay rent or utilities, or to put food on their table. You can donate to the St. Vincent de Paul Society using your contribution envelopes as marked. You can also donate online, using the link listed below. Thank you for your generosity! VOLUNTEER! 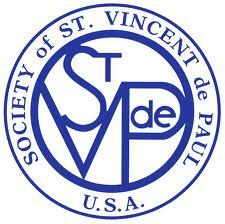 If you would like to volunteer for the SVdP chapter here at St. John, please call 513-777-6433, extension 120. DONATE! If you would like to donate to the SVdP chapter at St. John, please click HERE. REQUEST HELP! If you are in need of financial assistance, please call 777-6433, extension 120. Leave your information (as instructed by the recording) and someone will contact you as soon as possible.